Please note: The original set of these earrings has sold; this listing is for a custom, made-to-order pair in the same design that you see in these photos. Please choose your diamonds, and your colour of gold, when you order. 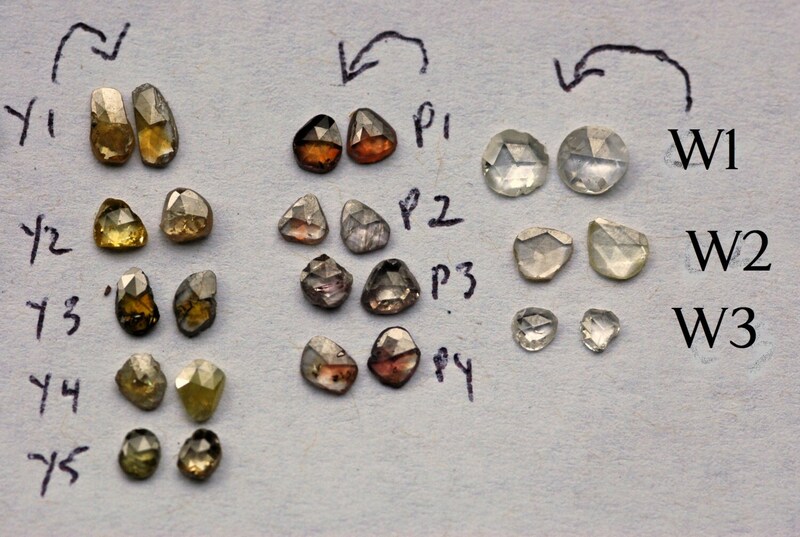 The available diamonds are in the final photo. 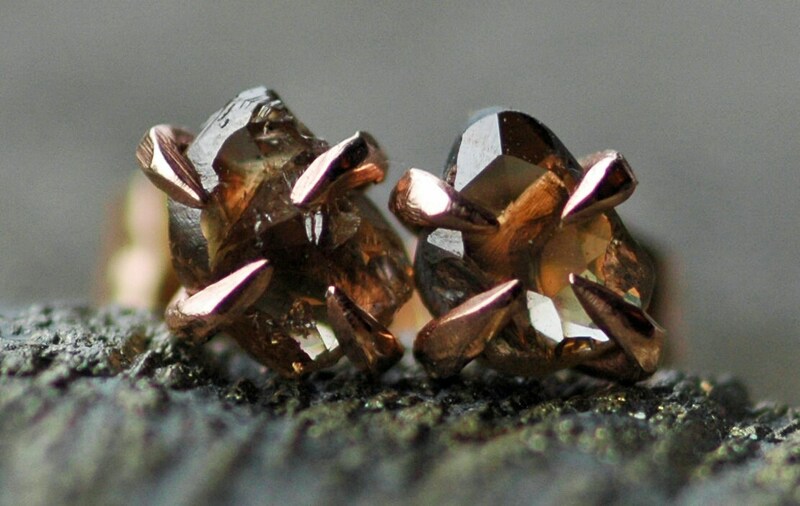 These are the perfect pair for the person who loves the ruggedness of rough diamonds, but also wants a sleek, high-end, custom-constructed set of earrings. Each pair of these earrings that I build is a unique set, as the diamonds are all individual in appearance. Please be sure to hit 'zoom' in the lower right-hand corner of each photo- there is tons of detail in these stones that cannot be seen from the regular-sized photo. I design these earrings around a nicely-matched set of rose cut diamond slices. The slices are captivating, translucent, and an organic free-form shape. They are very refractive and glittery. These have been hand-matched for me by my dealer- there are slight variations between each of the diamonds, but the sets are as nicely-matched for colour and shape as possible. 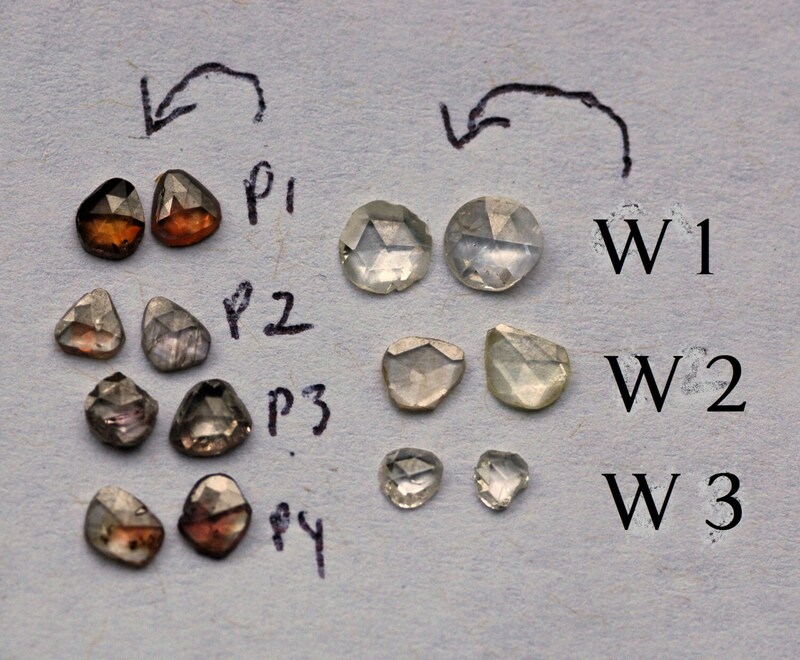 Some of the coloured diamonds have gorgeous inclusions that add to their rustic appearance. 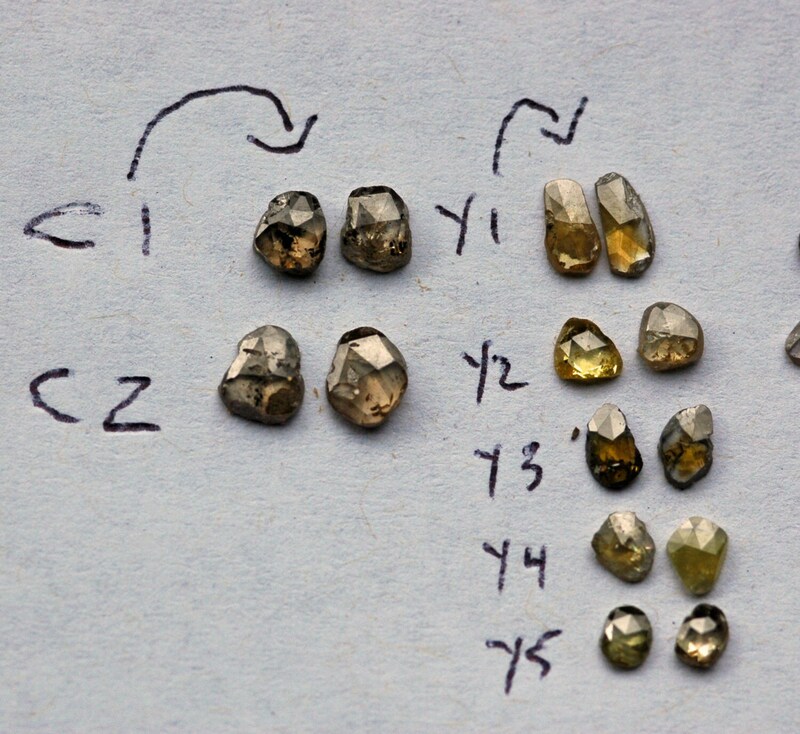 The diamonds are between 3.5mm (smallest yellow pair) and just over 5mm (largest cognac pair) and are certified conflict-free. These are one-of-a-kind pieces: for hygiene's sake, I am unable to shown them worn by a model. Please use a metric ruler to get a good idea of the scale of these earrings. A great way to get a visual on scale is to cut out a piece of paper in the same dimensions and shape as the diamonds, and to hold them to your ear- this is a much better way to gain perspective than seeing them worn by a model. 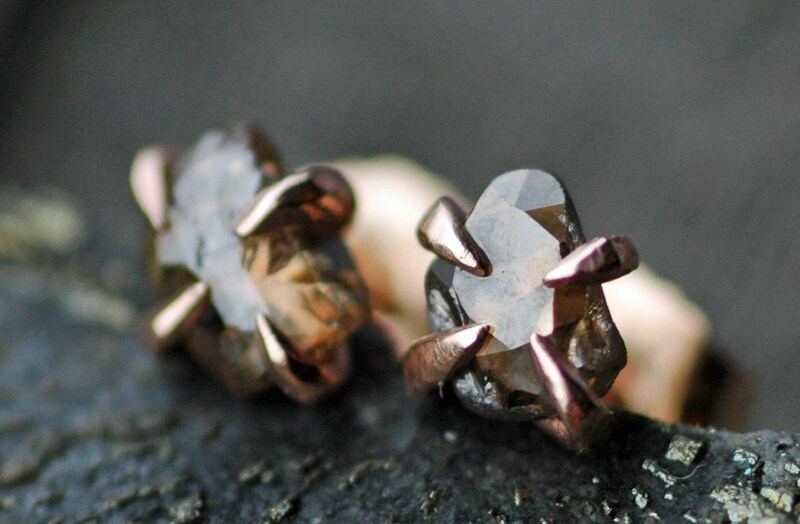 I hand-build the prong earrings in the photos from recycled gold. The prongs have been forged, filed, and sanded around the contours of the diamonds, and have an appearance that reminds me of little insect legs holding onto an object. If you do not see the diamonds you are interested in in the drop-down menu, they are sold out. The diamonds were colour graded, and priced accordingly, by my diamond dealer. Cognac is the least-costly colour, followed by yellow, then pink. Clear/white are the costliest. The cost of the earrings you choose depends upon both the diamond colour and size.